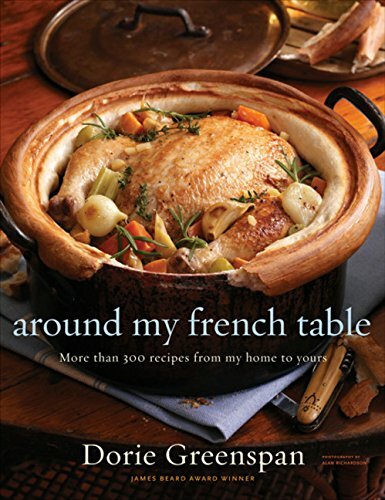 I’ve been wanting to make this recipe since I opened up Around My French Table for the first time. Just reading the title, I see everything I like. So it was fun to have this finally appear in the recipe line-up. What I really never thought about was the flavor combination of the seasonings: mint and orange. But it’s an interesting one. And I have learned (mostly) that Dorie can come up with some good, if unusual combinations. This method would work with any number of combinations of ingredients. 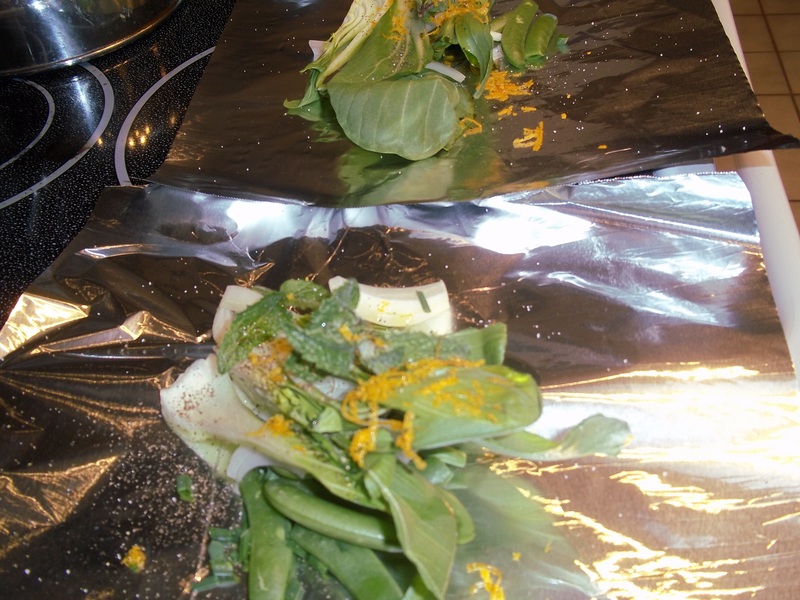 All of the vegetables get prepped, and the orange grated. 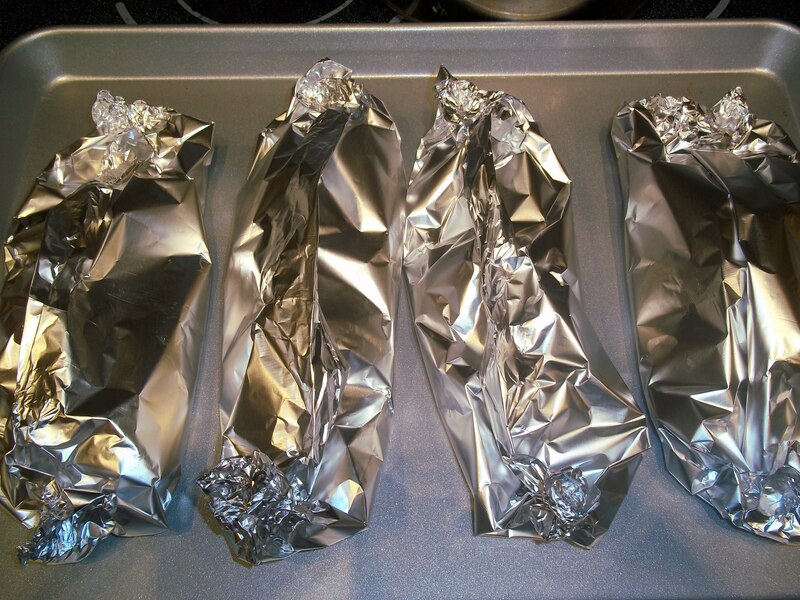 And then they get wrapped up in foil packets for the oven. These can be prepared ahead, and only take about 15 minutes at 400 degrees to emerge from the oven as some steaming vegetable goodness. 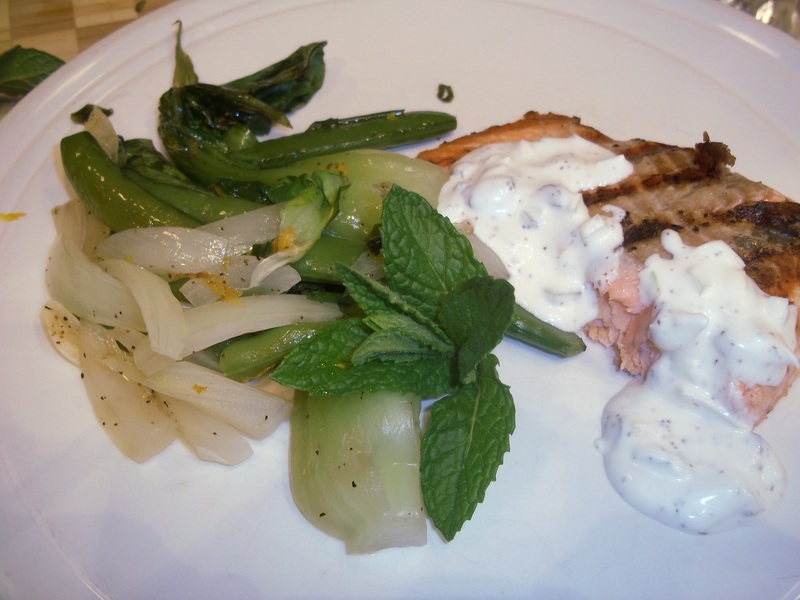 I paired the veggies with some wild-caught coho salmon along with a bit of sauce. It turned out to be a light, delicious meal. Was it worth the wait? It was very good. But certainly a surprise in terms of the flavors. I kind of liked the mint, but still would have loved this more with more of an Asian twist: soy sauce, ginger, even fermented black beans or chili paste. It is a great technique, and so easy (with nothing much to clean up either). So it was definitely worth it to try this out. 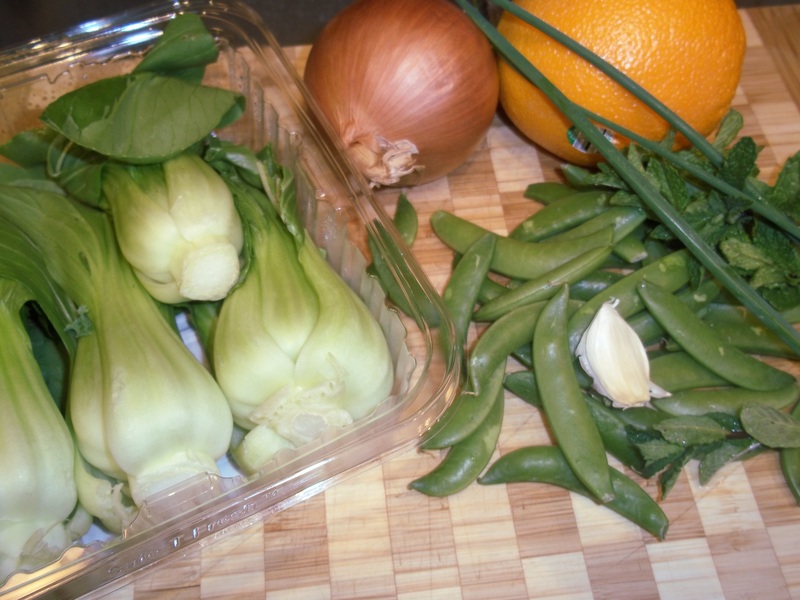 Posted on April 18, 2014 April 17, 2014 by dulceshomePosted in French Fridays with Dorie, Uncategorized, vegetablesTagged baby bok choy, sugar snap peas. Lookin’ good! So remember we did that Salmon and Tomatoes? But this combo would work just as well all in the same bundle, don’t you think? We really enjoyed it and will certainly have it again. 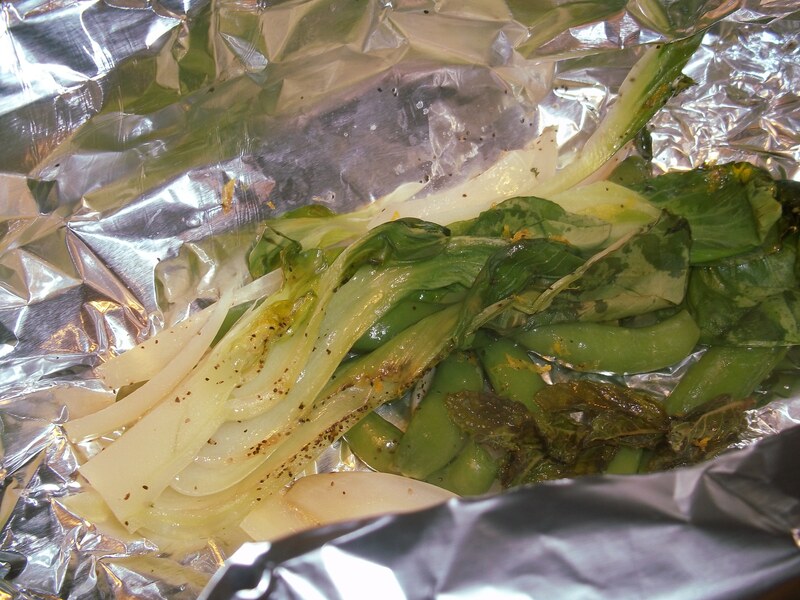 With my extra bok choy I made the recipe on the back of the Trader Joe’s container; minced garlic and minced ginger. It was good, nice Asian flavors. Great pairing with the salmon. I enjoyed these veggies. Next time, I need to try them with some Asian flavors. Hope you have a nice weekend. I didn’t love the orange and mint, and was thinking of lemon and some other herbs. Asian seasonings would be a natural though. Your meal does look delicious! Glad we all liked this recipe! Your results are fab! I used lemon zest instead of orange and it was delicious. It wasn’t really a conscious decision, more just because I already had lemons in the house. 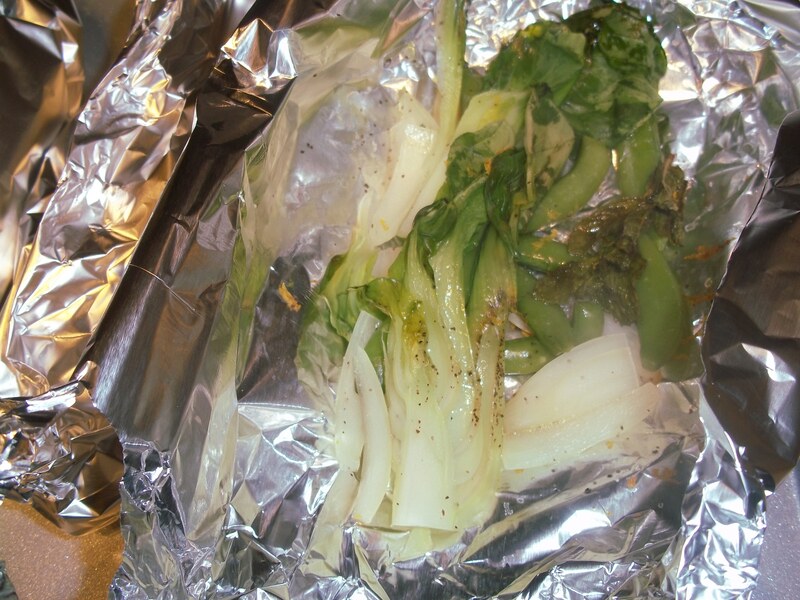 I was thinking next time about cooking the fish and the veggies together in a packet and seeing how that comes out. I like your idea of giving these veges an Asian twist – yum! Yes – having this with a miso glazed salmon or something is a great idea. The combo definitely made me think Asian cuisine (and I wanted to add ginger). Great suggestions with the soy sauce and the chili sauce! Remember the endives and grapes… I thought for sure that I would hate that one, but I liked it. The mint was really brilliant and I see that few of us are going to be adding it vegetable dishes in the future. Candy, your vegetables look perfectly steamed and utterly delicious – especially with that wonderful salmon as an accompaniment! It seems that the vegetables played a starring role this week! I served mine with wild coho too! I agree it was a great combination. I left out the mint because I wasn’t too sure of the flavor with the other ingredients. 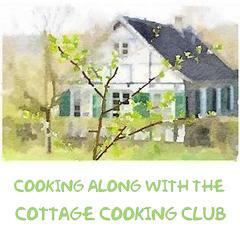 It is the perfect side dish for a light meal! I am happy that you finally got the chance to make it! When Dorie mentioned the Asian spices and flavorings, I immediately thought I’d like to try those instead. But, I had my darn mint already. I ended up liking this just as much as you did but will try this with different combinations. The salmon with the accompanying sauce sounds like the perfect entrée for these vegetables.